The Dandenong Stingrays have claimed their maiden TAC Cup Premiership in a thrilling win over the Oakleigh Chargers. 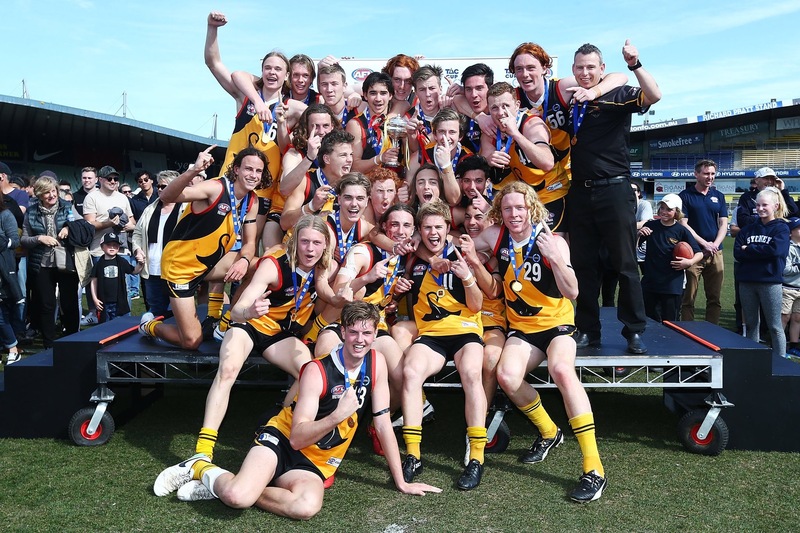 After 27 years and five grand final losses, the Stingrays finally claimed their maiden TAC Cup Premiership at IKON Park on Saturday afternoon. With the rampant Oakleigh Chargers standing between them and the trophy, the Rays rose to the occasion and a four-goal to zero second quarter set up the premiership win, 12.8 (80) to 11.8 (74). The first quarter was enthralling. Dandenong’s Riley Bowman was clunking marks and making his presence felt across the ground, while Lachlan Young was a man on a mission in defence. Bowman booted the first goal of the game, courtesy of a tremendous second effort tackle for which he was rewarded with a shot on goal after a holding the ball free kick. Zac Foot came to the fore at the 15-minute mark when he snapped through a major, but at quarter time, Oakleigh held a seven-point lead. The second quarter was when the Rays made their premiership move. Of course, it was co-captain Campbell Hustwaite who lead from the front. He was on the bottom of packs, running out of packs and tackling as if his life depended on it. A four-minute stretch saw the Rays take control of the game. It was started with a Bailey Williams long set shot goal from 50 metres out at the four-minute mark of the quarter, then the speedy Jai Taylor inspired his teammates with a chase down tackle in the middle of the ground, which resulted in a Toby Bedford goal. Just two minutes later, Hustwaite ran through the middle of the ground and drove the ball deep forward and it was Ed Cahill who got on the end of it to soccer through another Dandenong goal. It was a four-minute stretch of football that gave the Rays the confidence they could execute their game plan against the loaded Chargers. With Bedford, Cahill, Hustwaite, Bowman and Young patrolling their respective lines, the Rays held a 14-point lead at half time, 38-24. Oakleigh got off to the prefect start in the third quarter with a major just one-minute into the term, but the Rays responded. Finlay Bayne got on the scoreboard, and then just 40 seconds later, Lachlan McDonnell slotted a beautiful running goal to have Dandenong 21 points in front. The third quarter turned into a complete arm-wrestle. The two best sides in the competition going punch for punch was TAC Cup football at its finest. Goals to Williams and Sturt were offset by two classy goals for Oakleigh. With 25 minutes of football left in the season, the Rays had a 23-point lead. Sturt kicked his second goal of the game just four minutes into the fourth term and the Rays were a step closer to the ultimate prize. With 12 minutes to play, Dandenong held a 29-point lead, but the Chargers weren’t done. When Oakleigh’s Noah Anderson goaled at the 13-minute mark, the lead was cut to 23 points and suddenly, the Chargers were full of life and run. With five minutes left to play, a Jack Ross goal had Oakleigh suddenly just 12 points adrift and possessing all of the momentum. Dandenong’s defenders – who had stood up all season long – had five minutes to defend for their lives. Oakleigh’s Dylan Williams snapped a goal with two-and-a-half minutes remaining and it was just a goal the difference. The final couple of minutes were frantic and the crowd rode every kick. Dandenong’s defence stood tall and simply wouldn’t allow the Chargers to get the goal they so desperately craved. With it all on the line, the Rays held on for a thrilling six-point win, claiming their maiden premiership in the clubs sixth grand final appearance. Dandenong defeated Oakleigh 12.8 (80) to 11.8 (74). It was reward for a truly incredible season from the Rays. Just one loss all season was credit to the teamwork and desire to work for one another. Whenever they were challenged throughout the season – and most importantly in the grand final – they responded. The likes of captain Campbell Hustwaite, Ed Cahill, Riley Bowman, Bailey Wiliams, Lachlan Young and Zac Foot were sublime on the biggest day of the year. But in fairness, it was a total team effort; all 23 players on the field played their role and now they are all premiership players. For coach Craig Black – a former Rays player himself – in his final game with Dandenong, it was a fitting way to finish his time at the club. He has driven standards and developed some of the finest players in the land over his time with Dandenong and now he heads to Collingwood in a development role as a TAC Cup Premiership coach.